History comes to life with Popular Science magazine’s historical issues. They are conveniently scanned into an archive viewer online. 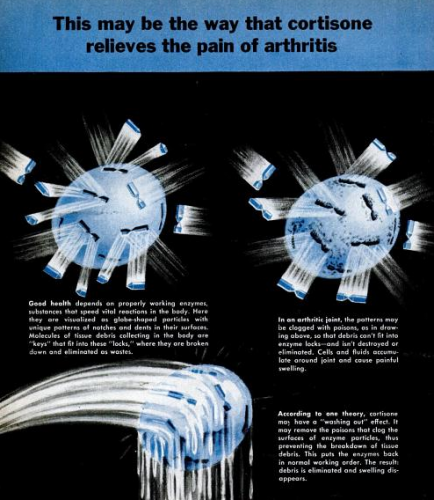 The screen shot here shows part of a graphic from a June 1951 issue. The article describes theories of why cortisone was so successful in treating Rheumatoid Arthritis. Looks like one theory then was that cortisone was literally a fire hose. The screen shot says a lot, but in case you are not laughing yet, here’s a quote from that article: “Says Dr. Hench of the Mayo Clinic: ‘ACTH and cortisone do not put out the fire, but they do provide an asbestos suit.’” Asbestos? When the Nobel Prize winning Mayo doctor called cortisone an asbestos suit for patients, he did not know how right he was. Of course that was before anyone knew that asbestos causes cancer. And they had no idea the horrific effects cortisone would soon produce. Drs. Phillip S. Hench, Edward C. Kendall, and Tadeus Reichstein did win the Nobel Prize in 1950 for the first use of cortisone. Click here to see a photo of the doctors in the laboratory where cortisone was first discovered. And stroll down memory lane at Mayo on this photo filled page with the Mayo brothers, lots of cool facts, and a photo of the plant with the first cortisone lab. During subsequent years, the miracle drug proved treacherous as numerous deaths and permanent side effects occurred. Eventually, cortisone was abandoned by most as a workable treatment for Rheumatoid Arthritis. I’m sure you know the old saying (click here if you don’t). Science marched on though and several derivatives of cortisone proved valuable for many conditions. “The steroid drugs – among them prednisone, prednisolone and dexamethasone – exert their anti-inflammatory effect by suppressing the cells and chemicals, such as histamine and serotonin, released in the inflammatory process” declared the New York Times in 1981. It is a fascinating account of the advances and setbacks for cortisone-related drugs like prednisone. The title of the piece is telling: Hailed and Feared Cortisone Now Safer and More Varied. It was hopeful to read about the ways that chemists manipulate molecular variations of corticosteroids to make them safer and more useful. Remember, that article was written in 1981! Does cortisone work on Rheumatoid Arthritis as a fire hose? We all know that prednisone (or prednisolone in some countries) is now prescribed to almost all Rheumatoid Arthritis patients at some point. Are you still wondering about the 1950 fire hose graphic? It just doesn’t seem sufficient to me either. In a more recent review of the fifty years with cortisone, a German rheumatologist writes in 2002: “Little is still known about the precise mechanisms of actions of glucocorticoids in general, and specifically when rheumatic autoimmune diseases are involved. The high effectiveness of these substances and their direct effects via the genomic glucocorticoid receptor allows us to anticipate that uncovering their mechanisms of action will shed deeper insight into the pathomechanisms of these diseases.” Little is still known – we still don’t know exactly why corticosteroids work. But it seems that thanks to them, we have many more clues about the diseases they treat. ← Would Relying on Patient Generated Data Make a Difference? Well, I got Cushings Syndrome from taking steriods for hypo-cortisolism, THEN I got diagnosed with RA just as I had to go on a low dose of Hydrocortisone. I went through the acute state of RA WITHOUT any steroids! Can you imagine? I’m glad I got diagnosed when I did, rather than in the “good old days”. Yes, unfortunately, I can. Actually, I don’t have to imagine. Kelly – If it’s not too personal, have you ever done steroids? They are the terror of my life anymore, both oral and injected. Went through a terrible case of Cushing Syndrome last year. Just had to up my dose another 2 mg. due to the flare and stress during Mom’s death. Does anyone else get steroid crazy? I had anxiety for years, but it was controlable until I added in steroids. Like throwing gas on a fire. One thing that helped was switching from prednisone to methylprednisone (sp). At least I didn’t feel like I was hanging from the ceiling by my fingernails all the time. I’m really curious about people that have gotten off of them. I made one attempt, got down to 2 mg. and it set off acute muscle spasms that had me literally falling out of bed, with a cane in my armpit to crab crawl to the bathroom. I couldn’t stand upright and the pain keened 24 hours a day. It was a very slow taper. Gave up grabbed a handful and restarted. Didn’t go to to doc, because – well, I didn’t expect any help locally. Anyway, have a good day, as much as possible. Today I’m going to do something, even if it’s wrong! Nanc, I’ve been reading a lot about steroid lately. One thing that some recommend is taking them on alternate days is one way to get off. Do you think it was caused by having a high dose? Maybe Alice could answer your question (posted below you). Any advice for Nanc (posted above you) or others who were on a high dose like that? Were you on other medicine with it? My highest dose was once 80mg/day and I did the same thing, quit cold turkey…not a good idea. I did finally come around to the whole tapering idea but my RA was so bad at the time I felt like I was in a perpetual flare even with the preds. I also was taking NSAID and a lot of pain meds along with methatrexate. I hated how they made me feel! My face was so round and full, I gained a bunch of weight, I always felt out of control and needed a lot of help getting sleep. I still take 3mg of that 80mg dose, the lowest I’ve ever taken and I think it has a lot to do with the newer RA drugs. Remicade worked well for me for about 5 years and now I am having pretty good effects from Actemra but when my RA flares, the first thing my doctor does is jack up my prednisone dose. I’ve just accepted that it’s going to be a part of my life/treatment. Thank you for sharing your story Noel. I know it helps others to hear experiences with it. I’ve had quite the relationship with prednisone over my 20+ years with RA. It’s been my best friend and something I’ve hated. I recently was on a high burst because of a flare and not only was it a “fire hose” I felt like it also came with a parade! I was bouncing off the walls and cleaning like a mad woman, I mean washing walls and scrubbing on my hands and knees. It was like a 3 or 4 day vacation from RA, I loved it! I take a measly 3mg per day now but it amazes me the difference just that small dose can make. Nanc-I had problems only while I was on steroids, called them b@*^% in a bottle. Once I was off of them I became a completely different person. I was on Arava while taking them and it could be that there was some connection there who knows. I’m on Methotrexate now and it is working just fine. I’m only a little sick the day of my injection and now I’m beginning to feel it start to work I have to go off for 3 wks. b/c of my neck surgery. If they are giving you muscle spasms when you quit you might want to ask your doc for Neurontin it keeps me from having them. Best of Luck and God Bless! I got Cushing’s Syndrome big time, and that was even BEFORE I got RA! These days, I get the occasional joint injection, but I cannot take oral Prednisone (or other steriods) for other medical reasons. I do like my shots, but I HATE Cushings Syndrome, weight gain, moon face, and stretch marks. I hate prednisone but it seems I cannot get off of it. I have had to stay on 10mg of prednisone for almost a month. I still cannot seem to get my pain and soreness under control. I am so frustrated. They checked my labs this week and my White Blood Cells were high and I was dumping glucose in my urine. I am scared that prednisone will induce Diabetes now. I am already prone with a family history. I feel like I cannot get ahead of the pain and every time I turn around my meds are causing further complications. Sorry to rant. I just want to feel better. Heather, that’s not a rant. Those are legitimate concerns. What “meds” do you mean cause complications? Prednisone? Can your dr. change you to a weaker version / help you to reduce it? Does h/she think you should reduce it? Maybe he could increase or add a dmard to your treatment combination if the RA is not controlled – I know I don’t have the complete picture. I’m just encouraging you to keep trying to find some way to do better. I know it’s hard. Prednisone is terrible for your bones. I was on a high dose for four years due to Reauhmatoid Arthritis and it caused osteonecrosis in both my hips. Ended up going for two hip decompression surgeries, that worked on left hip but failed the right, causing a total hip replacement one year later. If you can, stay away from this drug, I’ve refused it many times knowing that it does wonders for the pain, but the side affects are horrendous.